How did FloBeds begin to make natural latex mattresses in Northern California? It starts with sourcing the best materials possible. Our Latex Mattress cover is made with Organic euro-knit Cotton quilted to Organic Wool. Not only does the cover and wool provide you with soft yielding comfort that does not interfere with the natural latex inside, it is naturally fire resistant. That means we can provide pure comfort without chemicals. Inside the FloBed you will only find Talalay latex. A Talalay Latex Mattress costs more to make than a standard dunlop processed latex mattress, but the Talalay process results in a more supple and conforming latex foam that outlast regular latex. We try and keep it simple, source out only the best materials. Ship the product direct to you. Then, simply stand behind our product and back it up with real service. When a customer is so thrilled they make a video review! In the final episode of our mini-series, Lea Laase describes her experience working with the FloBeds staff. Lea found that her husband’s side of the mattress was perfect but her side needed some adjustments. So she called the FloBeds team and was told over the phone what changes she could make to start sleeping comfortably. The great thing about purchasing a FloBed is we are only one call away. Our team is here to support you in your quest for a better night’s sleep. FloBeds is at you Service — It’s Our Claim to Fame! Our sales staff works hard every day to bring our customers the best shopping experience possible. We know it can be difficult to make such a big purchase online. That is why we make it our mission to help you feel comfortable through the entire shopping experience. Have questions? Give us a call. Have questions and we are not open? Send us an email. Our trained firmness advisors are here to help you find the best fit for your personal needs. Literally, some of the best sales staff I have ever worked with. The crazy part, is that I have never even met these people in person. I feel like I’m a part of their family and that they honestly care about their customers and their products meeting the standards of their customers. I have been using my vzone bed for a little over a month now and my wife and I love it. I can also feel great about the fact that, if there ever comes a time when this bed doesn’t meet our specific needs, I can modify it to whatever specs I want (i.e. firmness). If my wife needs a change because she is aching from pregnancy, there are ways you can help with that with this bed. It’s truly an amazing company and I’m glad I did the research and took a hard look at the mattress industry to come to the conclusion to go with FloBeds. I couldn’t be happier. Last year we had the pleasure of working with the Albion Schoolhouse. This beautiful vacation rental on the coast of Northern California has multiple FloBeds. If you are looking for a getaway where you can get some peace, quiet and good sleep, look no further! It is always hard to go on vacation and leave the comfort of your FloBed Latex Mattress. A very important part of vacation is having the chance to catch up on your sleep. However, we all know what a gamble it can be when you go to a hotel and have to hope that the mattress is comfortable. Head on over The Albion Schoolhouse and you can rest assured that you will be able to catch some Z’s on a FloBed. Finding a new mattress can be an arduous task. We all know the drill- you enter a mattress store, work with a pushy salesman and leave with a mattress you don’t want. Here at FloBeds we like to do things a little differently. We educate customers about our latex mattresses, find the one that fits them best, guarantee a 100-night test rest and work with them to make any changes they may need. Here are some pointers on how the right bedroom setup can help you sleep better. Check these tips off your list and your will be on your way to dreamland in no time. 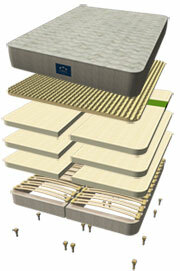 A custom mattress: Many people sleep on mattresses that are too firm or too soft. FloBeds can be customized, so your mattress can fit your body and sleeping habits just right. Our latex mattresses are extremely supportive and the layers in the mattresses can be switched around to achieve different firmnesses. The right height frame: Make sure it isn’t too difficult to get in and out of bed because of your bed frame height. Even the rules of Funghi suggest you pay attention to the height of your frame. FloBeds offers various height legs so you can find the best one that fit your needs. The right sleep temperature: Research shows that your bedroom should be between 60-67 degrees Fahrenheit. Invest in a smart thermostat to make sure your room is the right temperature. The right humidity: “Extreme weather conditions impact our mood, our health, and can even our sleep. When the air has a high humidity concentration, we feel hot and sweaty – which means uncomfortable sleep. When the air is too dry, on the other end, our skin, eye and nasal passages dry out which is also uncomfortable.”-Huff Post According to the National Sleep Foundation your room should always be at 50% humidity.